Please note that our 18-to-Thirtysomethings accommodation in Europe is multi-share. For more info, see the "About Accommodation" section under "Tour Details". Your flight must arrive by or before: 15:00 on Day 1. There's plenty to see and do in Paris, and we wanted to make sure that you had some time to take it all in. Feel free to relax or try optional activities like getting acquainted with Mona Lisa at the Louvre, marvel at the architecture of the Notre Dame Cathedral, and visiting the Arc de Triomphe. Your CEO has more ideas if you need them. Just ask! Spend some time at The August Rodin Museum, one of Paris' most enjoyable museums. With famous sculptures on display like the Burghers of Calais, The Gates of Hell, The Hand of God, The Kiss and The Thinker, you can wander through this former mansion, marvelling at the architecture as well as Rodin's best work. Wander past high end retail shops, cafés and theatres before reaching the famous Arc de Triomphe. Visit the Basilique du Sacré-Coeur, located in the Montmartre neighbourhood. This Roman Catholic church was completed in 1914 and stands on the highest point of the city. Climb up 200 stairs to reach the dome of the basilica to get an amazing view of the Paris skyline. 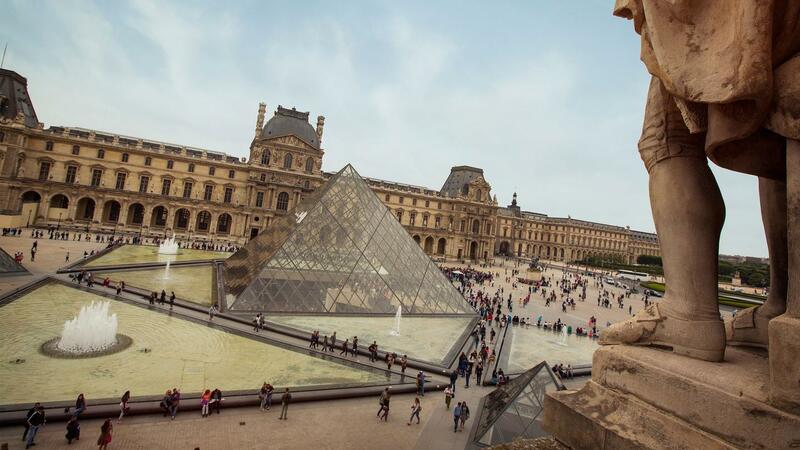 Examine the massive collection at the Louvre, home to the Mona Lisa and the Winged Venus. While it might take a lifetime to view everything in the museum, one of the largest in the world, make the most of the time you have and try to spend at least a few hours wandering around. 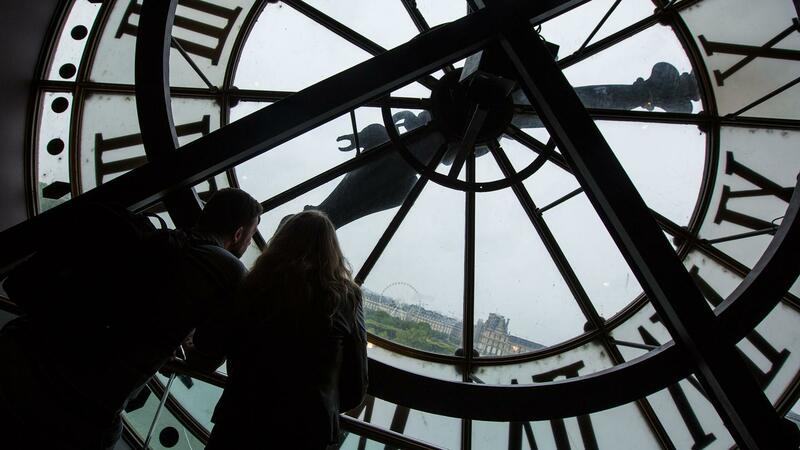 Tour through The Musée d'Orsay, a must-see museum in Paris. Housed in a former train station, the beautiful building is the perfect setting to display some of the world's most revered Impressionist art. Wander from room to room in awe at the works on display by Monet, Renoir, Cézanne and Gauguin. Marvel at Degas' ballerinas and Van Gogh's swirling colours. 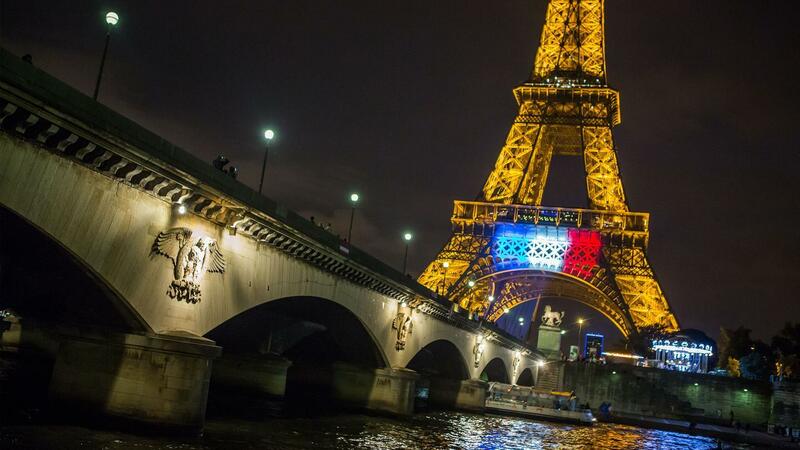 Visit the most famous landmark in France, the Eiffel Tower. Opt to climb the stairs or take an elevator to the top for a stunning view over the city. Hang out at dusk and watch the tower light up. There's plenty to see and do in Interlaken, and we wanted to make sure that you had some time to take it all in. Feel free to relax or try optional activities like canyoneering in Interlaken Canyon, hitting the trails for a hike in the Swiss Alps, or watch the sun set from Harder Kulm. Your CEO has more ideas if you need them. Just ask! Strap into a tandem paragliding harness with an expert paraglider and fly over beautiful Interlaken and its surrounding mountains. The world is a whole lot more peaceful while gliding above this scenic landscape. Get kitted out in a harness, and come face-to-face with your inner afraid-of-height demons high above the ground on rope bridges, Tarzan swings and ziplines. Not afraid of heights? No problem-this will still be the adrenaline experience of a lifetime. Jump, slide, rappel, and get ready for a thrilling experience while canyoning. Whatever you do, make sure you hold on! This activity is sure to be a highlight of any trip to Interlaken, the landscape here is known for some of the best canyoning opportunities on the globe. Lace up your hiking boots and get hiking in the Swiss Alps. There are many hikes of varying difficulties either up or down the mountains or along the meandering shores of nearby lakes. Don't forget a camera because no one's going to believe just how spectacular the views are here without proof. Ever wanted to taste wold-famous Swiss chocolate? Here is your chance to make it, too. Get tips and tricks first hand from professional Chocolatiers. Learn to temper, melt, pour chocolate. Oh, and the best part: taste your creation. Take a ride up to Europe’s highest-altitude railway station via this cogwheel railway. Enjoys the incredible panoramic views along the way. 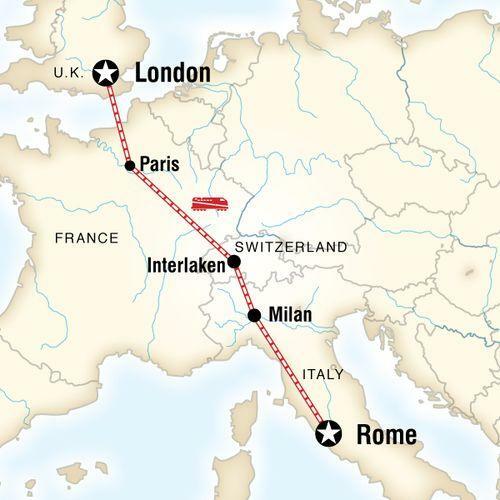 Travel to Rome by train via Milan. 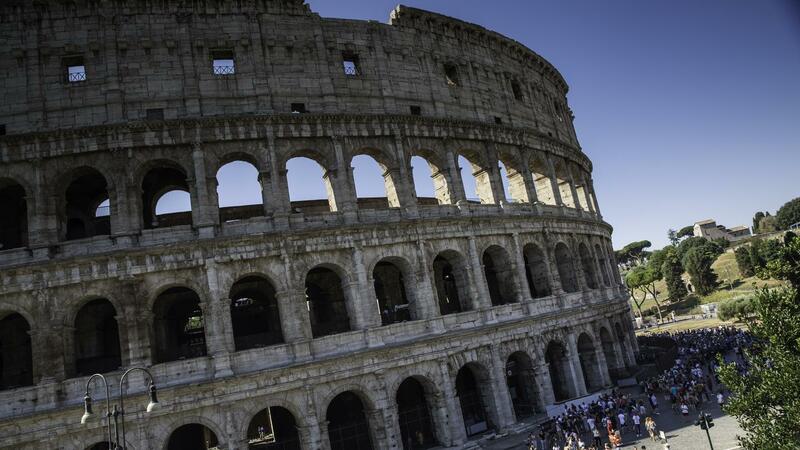 Upon arrival, enjoy a CEO-led orientation walk of Rome. Climb aboard, take your seat, and get around like the locals do. 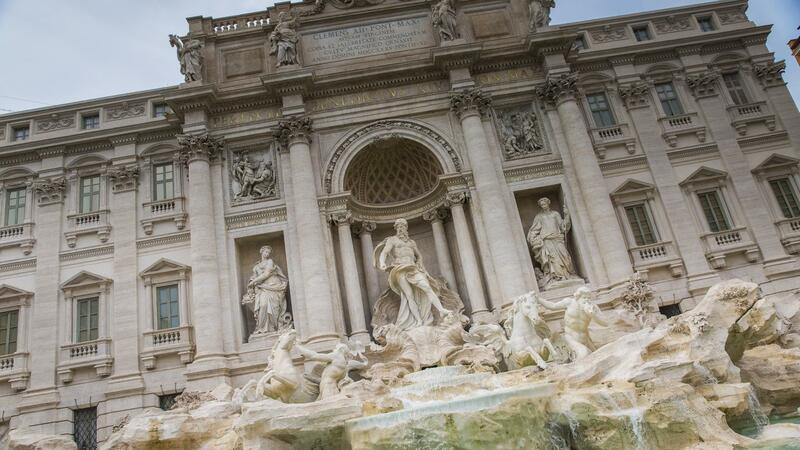 Enjoy the rest of the day to explore Rome. 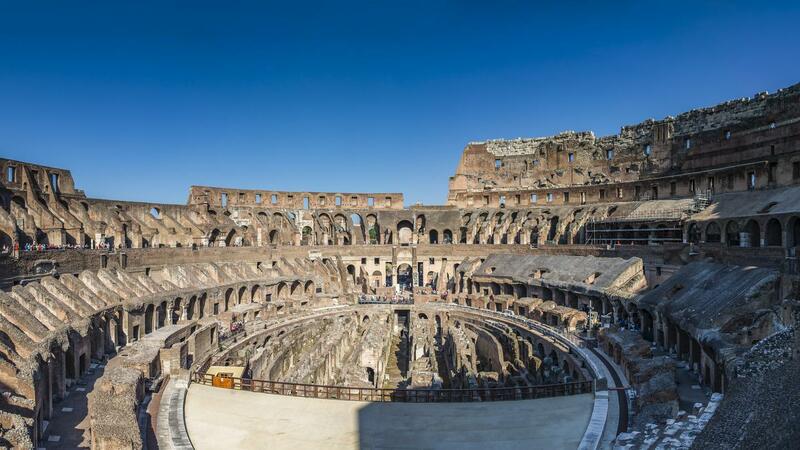 Enjoy a visit to this famous spot, the scene of many bloody gladiator fights for the entertainment of ancient Rome's aristocracy. Take a tour of the old venue-a UNESCO World Heritage site-and feel free to walk around on your own. No battles, please! Even with the bustle of modern day Rome whizzing past on Vespas, you can still lose yourself in the fragmented columns and ancient ruins of this plaza, conjuring images of the rich Romans sauntering by in togas. The Pantheon is one of the most famous buildings in Rome. Originally built during the reign of Augustus (27 BC - 14 AD), the building was rebuilt under Hadrian in 126 AD. The roof is still the world's largest unreinforced concrete dome, and it contains a circular opening (an oculus). It is easily one of the best-preserved of all the ancient Roman buildings. Get ready to tick something off the bucket list. 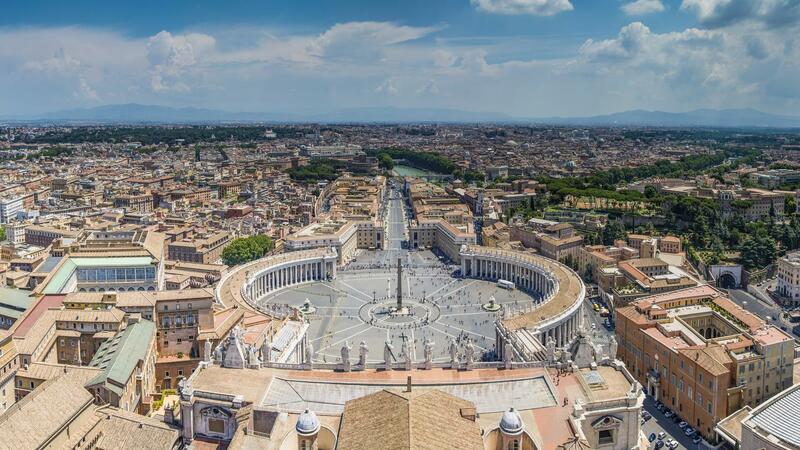 Visit the smallest country in the world-Vatican City! 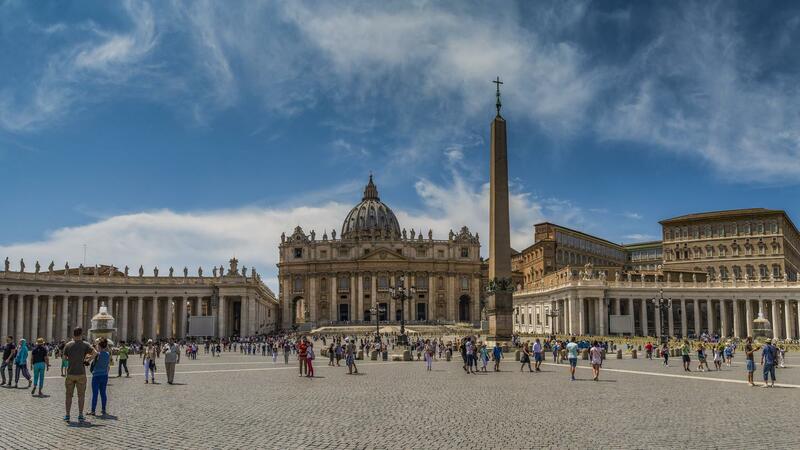 Stand in St Peter’s Square and be wowed by colossal colonnades, numerous statues, and the obelisk. Opt to take in the magnificence of St Peter’s Basilica, Michelangelo’s Pietá, and the Sistine Chapel while you are in the area. 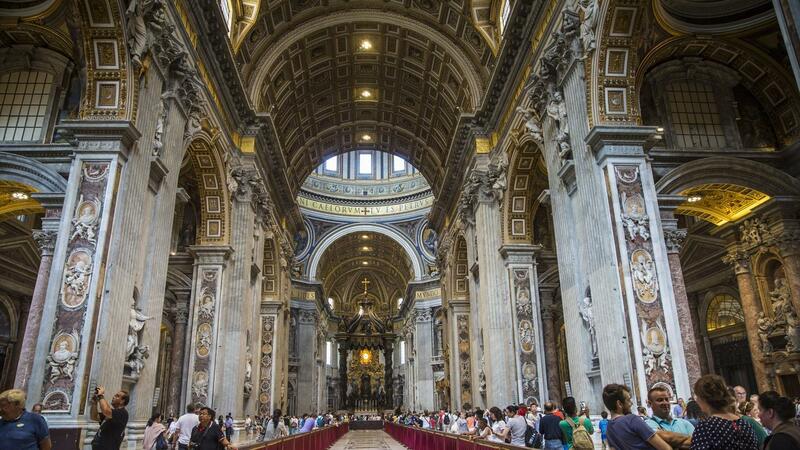 The Vatican Museums are near St Peter's Basilica and contain priceless works of art from ancient to modern times. There are many different galleries but seeing all of them is definitely not possible in one day, so do a little research before visiting and decide what you really want to see. Two of the most well-known exhibits in the Vatican Museums are the Sistine Chapel and the Raphael rooms. 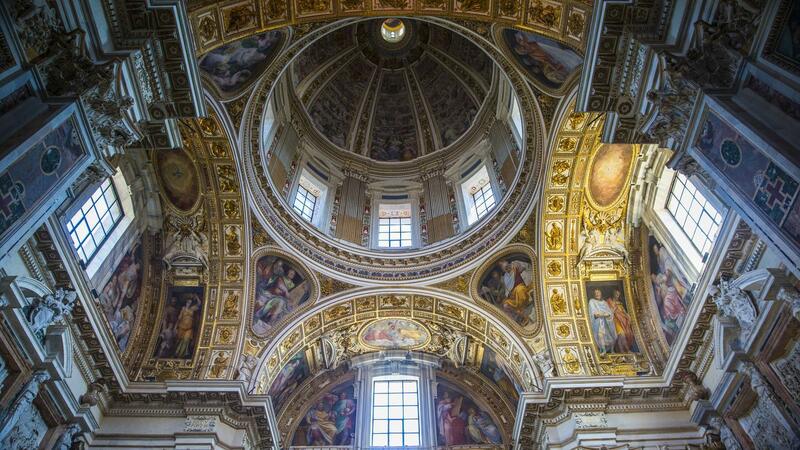 Although the Sistine Chapel is always very crowded, it is a must-see for any visitor to the Vatican. The magnificent frescoed ceiling of the chapel painted by Michelangelo depicts over 300 figures from the Book of Genesis, the most well-known being “The Creation of Adam,” showing God touching the finger of Adam. “The Last Judgment” on the west wall depicts a scene from the Book of Revelations. Art aficionados, get ready to cross one of your list! Follow a guide through this ancient underground cemetary. Take a visit to the beautiful Borghese Gallery villa to indulge in a rich collection of ancient sculptures, relics, mosaics, and paintings. Pieces from Renaissance masters such as Bellini, Raphael, Bernini can be found here. Cross the Tiber river to reach the quaint medieval neighbourhood of Trastevere. This is a great opportunities to escape the crowds and get a glimpse into local life. Simple hotels/hostels (6 nts, multi-share). Allow USD230-300 for meals not included. Picnic in front of Eiffel Tower (Paris). Orientation walk in Interlaken and Rome. All transport between destinations and to/from included activities. Explore historic cities and their galleries and museums, sample regional flavours, visit four countries in seven days, take in the scenery from the Swiss Alps. 1.It is important to note that in Europe, all guiding is based around local guides all of whom are licensed to work only in a particular city. As such, our leaders are able to provide orientation walks which will show you the layout of each town and city as well as the location of local services such as post offices and laundromats, but are unable to legally share historical facts and figures in public places. 3.This trip has a fast-paced itinerary with some long transport days - please check the itinerary carefully before deciding if this trip suits your needs. The trip commences at 5:30pm at Cafe Benugo on the ground floor in St. Pancras International Station. It's imperative to arrive on time to ensure boarding to the Eurostar. There will be a table reserved, and your CEO will be waiting with a G Adventures logo on the table. If you arrive early, luggage storage is available at St. Pancras Station. The exact time of departure from St. Pancras to Paris will vary, but there will be time for you to buy some food before we leave or maybe even a celebratory drop of champagne at the longest champagne bar in the world! London Luton Airport – Take the shuttle bus (free if you buy a train ticket from Luton Airport to London) to Luton Airport Parkway train station. From there, take the train to King’s Cross/London St. Pancras train station. Price around £15.00 - £20.00 and the overall journey time is roughly 1 hour. We don't expect any problems, and nor should you, but if for any reason you are unable to commence your trip as scheduled, as soon as possible please contact your starting point hotel, requesting that you speak to or leave a message for your CEO. If you are unable to get in touch with your CEO, please refer to our emergency contact details. Credit cards and debit cards are very useful for cash advances but you must remember to bring your PIN number (be aware that many ATM machines only accept 4-digit PINs). Both Cirrus and Plus system cards are the most widely accepted debit cards. Visa cards are the most widely accepted credit cards. While ATMs are commonly available, there are no guarantees that your credit or debit cards will actually work - check with your bank. You should be aware when purchasing products or services on a credit card, that a fee usually applies.